This software application contains a broad set of functions that make data analysis and data management fast and efficient. CI Hex Viewer provides advanced tools for easy and accurate work – data search, comparison, modification and interpretation. The software has advanced multi-mode data search mechanisms with powerful search engine and offers easy navigation with flexible direct and relative \'go to\' operations. Enhanced convenience of the software will be a strong plus during data editing operations. CI Hex Viewer includes a wide range of tools serving for easy data modifications - adjustment of data amount with copy, paste, undo of configurable depth; block data handling etc. Effective data interpretation techniques allow to achieve correct binary data decoding. As a full-featured program CI Hex Viewer can also be applied to data analysis and management on complex RAID-systems. The software supports external modules of UFS Explorer Standard Recovery forming a powerful and efficient utility for data analysis and management on RAID-systems and virtual image files of Runtime Software. Additional software functions include file split, append, truncate, save range etc. This easy-to-use software application will be an essential element for any data recovery operations and data analysis cases. 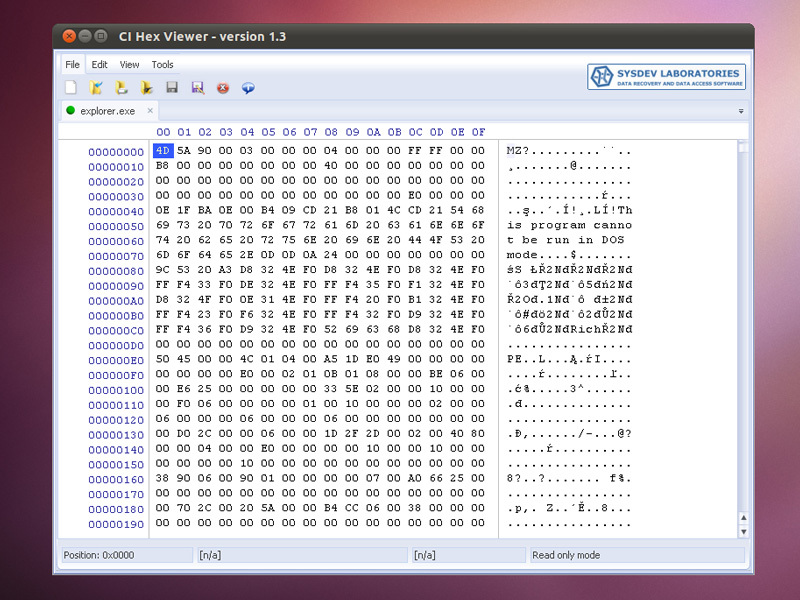 CI Hex Viewer supports different operating systems and is distributed on free-of-charge bases.